Kyung-jin Kim utilizes diverse media to approach the substance of liminality inherent to dislocation, translation and adjustment. His method looks to scattered encounters with networks and systems of data, and to how this experience shifts with proximity, as well as the motions and elisions of one's memory. Through sculpture and models, video projections, and interactive sound installations, Kim inducts a sense of what cannot be known through palpable lapse and void. Kyung-jin Kim concentrates on grasping the possible loss caused by shifts and time gaps: the void between objective fact and subjective understanding dependent on physical placement. His Solo exhibition ‘Nothing Personal’ was shown at the Flux Factory Gallery in 2018 / Long Island City, New York. ‘Nothing Personal’ is an interactive sound installation triggers by participant’s voice. It is an environment that every component influences its surroundings, while interacting with one another. The work achieves a ripple effect as the sound vibrations are materialized by way of a bobble head and through the use of a seesaw microphone, a long range listening device, a security camera and a windmill. Exhibition venues include Gallery MC (NY), Korean Cultural Center NY, MASS MoCA Open Studios (MA), Vermont Studio Center (VT), Governors Island Art Fair 2018 (NY). He participated ACRE Residency (WI), MASS MoCA Residency (MA), Vermont Studio Center Residency (VT), Flux Factory Residency (NY). Recently, he was selected and shown his practice at the Sculpture Space residency program, Utica (Feb~Mar, 2019). See images of his artwork at artist’s Vimeo profile. 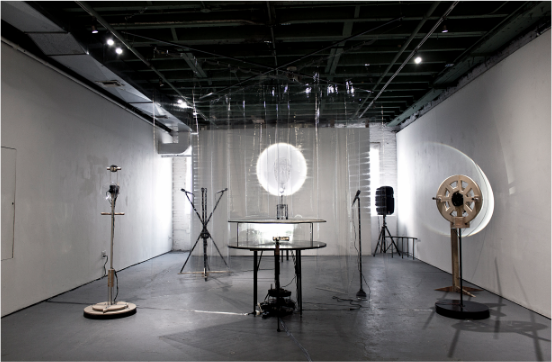 Support: Kyung-jin Kim' residency is made possible with funding from The Cultural Development Fund from NYC Department of Cultural Affairs and National Endowment for the Arts /Artworks Grant.